The name of the search program, e.g., "Kojak" or "XQuest" Used to reference this search program in this document. If present, the value for this attribute will be used to display the name of this program in the web site. If abscent the value for "name" will be used. The version of the above program that was run to generate these results. (Optional) A description of the search program. The types of annotations this search program has for PSMs--such as quality scores. 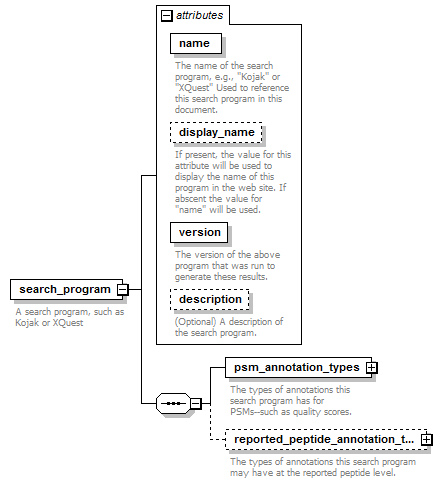 The types of annotations this search program may have at the reported peptide level.